The intention of the project was to research Nancy Astor and the way she was seen in the public eye in the context of changing women’s rights and as she held political power. I have examined comparative portraits, which present Astor in a number of different contexts. 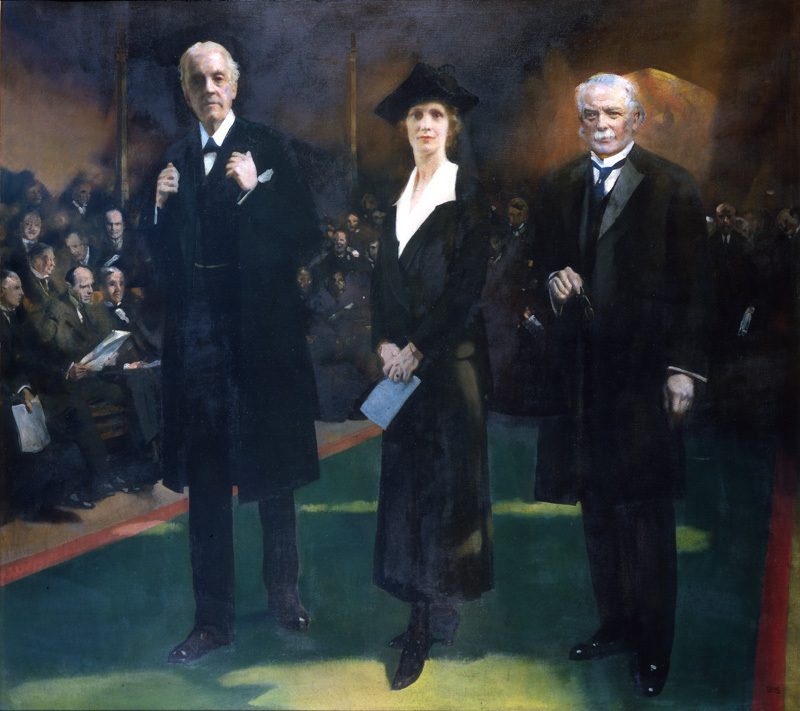 The three portraits studied were Lady Astor being introduced to the House of Commons by Lloyd George and F.H. Shepherd, by Charles Sims, RA (Plymouth City Museum & Art Gallery), Hon. Michael Langhorne Astor; Sir John Jacob Astor; Nancy Witcher Astor by Bassano (NPG), and Lady Astor by John Singer Sargent (Clivedon). My findings have shown that Astor used her portrait by Sargent consistently on the campaign leaflet that she used to canvas to become a Labour MP, changing the function of the portrait from personal to a political one. At that time Astor had to project herself as a powerful woman who could be relied upon. The portraits of Astor with her family were important as they projected how she was surrounded by politically important people at that time which gave her further credibility. Nevertheless, portraits of her with her family touched people as a woman she should be expected to be the heart of the family. The bursary project has allowed Plymouth City Museum and Art Gallery (PCMAG) to raise awareness and understanding of these key works for our existing audience, it has helped in developing the interpretation of the portraits and this has engaged the interest of an existing and new audience. The research is available as part of our ‘Women in Art’ exhibition (March 2012-March 2013) and will also contribute to ‘The Many Faces of Astor’ planned for 2013. This exhibition will include free ‘Art Bites’ (thirty minute tours of the collection) and longer ‘Tuesday Talks’ to which my research will contribute. Further information on Nancy Astor will be available in the form of downloadable information sheets from PCMAG’s website for those unable to attend the exhibitions. The bursary has enabled me to take part in these events furthering my development and knowledge in the heritage sector in ways I would not have been able to before, furthering my development and knowledge. I have also been able to work with professionals in multiple fields I would not have had the opportunity to otherwise, and I have also developed my knowledge of the history of the local community in Plymouth.